In the excavation season of 1934 some attention was turned to the so-called Dog Gate (Porte du Chien) which had figured so prominently in the campaigns of the Crusaders to capture the city in 1098. The Dog Gate has been placed in some map versions reconstructing the street layout as the point at which the street running the length of the East side of the circus reaches the branch of the Orontes and then turns to meet the different orientation of the Hippodamian grid on the south-east side of the river. "Other investigations carried on at Antioch included an excavation lasting about a month in the sector Antioch 12-N where, at an angle of the wall of Justinian, local tradition placed a gateway, known as Bab-El-Kelb, from the figure of a dog (?) carved on the stonework. During the past century the superstructure of the gate has been entirely removed by pilferers of stone, but the excavations revealed the fact that in antiquity there was, actually, a gate at this point." The recent release of the Princeton Photo Archives allows us to now see the images taken at the site during this work. Unfortunately the images are very small, without a click to enlarge component. However we have downloaded the thumbnails and readers can blow them up as best they can to see detail. Porphyry columns under Byzantine level. General view of the basalt pavement outside the city wall. Detail of the basalt pavement outside the city wall. Basalt pavement inside and outside the city gate. Limestone staircase and pavement inside the city wall. Limestone staircase, pavement and wall. City wall and rough pavement. Cement level under basalt pavement. Detail of wall under late staircase. Foundation of Justinian wall and more ancient walls. View of trench west of basalt pavement showing foundation of cement pavement and walls. West trench with brick walls. General view of excavations in the West Trench. View of brick wall with big niche in the West Trench. Trench following the remains of the ancient wall. Also we might note that this extensive excavation effort was never written up with more than the scant comment above and so thus we would strongly suspect that the excavation notes/plans moulder away unpublished in some box in the basement at Princeton to this day. 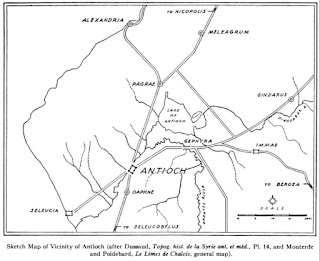 Usually we try to avoid the more "recent" aspects of Antioch's history, but the city's relevance is popularly believed to have ended with the destruction wrought by Sultan Baibars in 1268. I have stumbled upon an interesting text relating a progress made around his domains by the Sultan Qa'itbay in the mid-14th century. This translation and commentary was written by Henriette Devonshire in the Bulletin de l'Institut Français d'Archéologie Orientale in 1922. BIFAO 20 (1922), p. 1-43 : "[al-qawl al-mustazraf fî safar mawlânâ al-malik al-Ashraf.] Relation d'un voyage du sultan Qâitbây en Palestine et en Syrie". Qa'itbay was the Sultan of Egypt from 872-901 A.H. (AD 1468-1496). He toured around the northern extremities of his domains that stretched as far as Antioch and Aleppo. After heading up the coast as far as Latakia, he headed inland to Antakiya. While Antioch is only briefly mentioned it does give some colour from a period where there are virtually no texts. "Nous trouvâmes dans cette ville d'immenses et solides constructions; les murs enormes et garnis de tours vont de haut de la montagne jusqu'a l'embouchure de la riviere, de sorte que la ville entiere avec ses cultures, ses champs, ses proprietes et sa riviere se trouve a l'interieur des murailles. La ville meme contient sept collines sur une desquelles se trouve une citadelle; la longeur des murs est de 12 milles; les tours sont au nombre de 136 et les creneaux de 24,000. Antakiya fut conquise par El Malik ez Zahir Beibars; elle contient beaucoup de boutiques, des marches, et la population en est nombreuse. Mais ce sont Turcomans peu civilises et leurs maisons ont des pignons dont les toits en pente sont de bois recouvert de fascines de chaume que l'on appelle bourda. C'est la que se trouve le Sanctuaire de Sidi Djib en Nadjdjar - que Dieu nous soit propice par ses vertus! - situe entre deux larges collines a pentes douces." The report tells us what we already knew, that of all things, the walls and fortress of Antioch survived far longer than the structures of the graeco-roman city. However, it seems here that some 200 years after Baibars destruction of the city, the place was fairly lively with an active commercial life. This must be taken in context that what looked like a thriving city in the mid-1400s was all relative when many great cities had shrunk to small towns and so any conurbation of more than 10,000 people looked like a metropolis. The city had clearly become mainly Turkish by this point and that population lived in structures which struck the author for their flimsiness and their thatched roofs which were not common in urban settings in the Middle East at that time. The seven hills are mentioned for the first time we have heard. We cannot imagine what these are. It is notable though because both Rome and Constantinople had their "seven hills" and Qa'itbay did not come from that tradition of giving import to this topographical distinction. A river "inside the walls" is mentioned, presumably the Parmenios. We have what I think is the first mention I have found of the Najjar mosque. The circus factions were as lively in Antioch as the other major cities of the Empire and in some ways Antioch was closer to Constantinople in suffering from fans of the Blues and Greens that went the extra mile in lootings, riotous behaviour and creating mayhem. They were the soccer hooligans of their day and more, bringing down governments and burning large parts of the cities went their enthusiasms got the better of them. Mostly they were led by individuals with a penchant for political maneuvering and the factions were the instruments of their wielding of power. These were not typically actual participants in the sport. However there are a few examples of chariot drivers becoming initiators in a fracas. 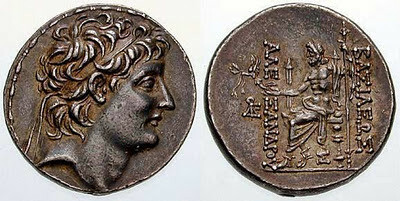 Once such was a driver in the 6th century called Porphyrius, who was supposedly born in Africa (Libya), but was reared in Constantinople, where he began racing with the Blue faction while still very young but then changed to the Greens under the emperor Anastasius and back to the Blues under Justin I. He continued to race even into his sixties and seems to have adopted Calliopas as his name later in life. As the epigrams proclaim, he was the first charioteer to have his statues erected in the Hippodrome while still competing and the first to have a statue (indeed, at least two) from each faction. Malalas records for the year AD 507 that Kalliopas (Calliopas, the name by which Porphyrius is addressed in five of the epigrams), "an ex-factionarius [the most senior charioteer who drove for either the Blues or Greens] from Constantinople....took over the stable of the Green faction, which was vacant, and was completely victorious". The interesting thing from our point of view is that like an early version of Beckham he toured the known world exercising his charioteering skills and even led an attack on the Jewish synagogue in Antioch in AD 507. "They set fire to it, plundered everything that was in the synagogue and massacred many people," setting up a cross there and turning the site into a martyrium (Chronicle, XVI.6). Whether this was on instructions from a higher power or not is not recorded. However, Porphyrius was clearly partisan to the "powers that were" for in a fragment, Malalas also relates that Porphyrius helped rally support for the Emperor Anastasius during the revolt of Vitalian in AD 515 (cf. Epigram 350, where the emperor, "with the Greens to assist him, warred with the furiously raging enemy of the throne"). In appreciation, Anastasius, who, himself, favored the Reds, restored the privileges of the Greens and permitted them to erect a new statue of Porphyrius. The history of Ancient Antioch is inextricably wound up with that of the Seleucid dynasty, who not only founded the city but made it their residenzstadt and built it into one of the most important cities in the ancient world. Its preeminence in its zone of the Eastern Mediterranean was already established before the Romans pushed into the area and they realised the inevitability of its remaining as the regional capital. While nothing remains visible of the city the Seleucids built the hope remains that some of its may be brought to light some day. The history of the dynasty is well known but their legacy in the city is more sketchy. After the initial founding and the construction of some sanctuaries the record runs cold. We don't even know anything of their palace(s) within the city. I have come across a very informative website this week though that lays out visually the history/genealogy of the dynasty dividing it into an Early and a Later phase. Here is an excerpt from an article from William Waddington, a pioneer of inscriptions in Syria. In it he discussed the subject of the calendar usages in Syria. We have picked out the part where we discusses the Antiochene "year". "Ici encore les monuments et les inscriptions abondent, mais, bien que l'architecture soit à peu près la même que celle des édifices d'El-Barra, les chiffres des dates sont beaucoup moins élevés, et si on les rapportait à l'ère des Séleucides, la construction de toutes ces églises, plus ornées et plus vastes que celles d'El-Barra, tomberait en plein paganisme, à l'époque des plus cruelles persécutions de l'Eglise. Il faut donc chercher une autre ère, et le doute n'est point permis; tout ce district est voisin d'Antioche, la grande métropole païenne et chrétienne de la Syrie, et l'ère en usage à Antioche doit être celle qui a été employée ici. Le point de départ de cette ère a été déterminé par Noris et Belley, et, ensuite, plus exactement, par Ideler; elle commence à l'automne de l'année 49 avant .l.-C. Le véritable commencement de l'année syrienne était le 1er octobre, mais, à une époque qu'on ne peut déterminer avec précision, on le recula d'un mois et on fit coïncider le commencement de l'année civile avec celui de l'indiction, c'est-à-dire avec le 1er septembre. On trouve dans les auteurs des exemples des deux manières de compter, et nous verrons qu'il en est de même dans les inscriptions. Ainsi l'historien ecclésiastique Évagrius, qui écrivait à Antioche au Vie siècle, fait commencer l'année au 1er septembre, comme l'a démontré Ideler (i, p. 453), et l'historien syrien Abou'l-Faradj dit que, de son temps, les Grecs de Syrie commençaient l'année au 4er septembre, tandis que les Syriens proprement dits conservaient l'ancien usage du 4er octobre. » Dans le district de Deir-Semân, habité autrefois par les populations hellénisées, syriennes d'origine,' mais ne parlant plus que le grec, l'usage avait prévalu de faire coïncider le commencement de l'année avec celui de l'indiction. L'inscription suivante en est la preuve; elle a été copiée par M. de Vogué, au village de Dana, sur une grande maison antique; elle est datée du 27 de gorpiaeus, de l'an 532 et de la septième indiction. L'année 532 de l'ère d'Antioche, ainsi que la septième indiction, commence au 1er septembre 483, et l'inscription a été gravée le 27 septembre de cette année; si on faisait commencer l'année au 1er octobre 483, le 27 gorpiaeus 532 correspondrait au 27 septembre 484; mais alors la huitième, indiction était déjà commencée, et il n'y aurait plus accord entre les deux données. Deux autres inscriptions, datées du mois d'août et du mois d'octobre, s'accordent avec l'un et l'autre système. Mais il n'en est pas ainsi d'un autre texte, trouvé à Ktell-Lata, à la lisière septentrionale des montagnes d'El-Barra. Elle est datée de l'an 497 et de la troisième indiction; l'année 497 d'Antioche commence à l'automne de l'an 448 de notre ère, et la troisième indiction au 1er septembre de l'an 449; si donc l'année de l'ère locale commençait, comme l'indiction, au 1er septembre, il y aurait juste une année de différence entre l'année de l'ère et l'indiction, et les deux données chronologiques ne s'accorderaient point entre elles; mais si l'on fait commencer l'année de l'ère locale au 4er octobre, le dernier mois de cette année coïncidera avec le premier mois de la troisième indiction, et il en résultera que l'inscription a été gravée au mois de septembre 449. On se demande pourquoi les anciens habitants du village de Ktell-Lata ont employé l'ère d'Antioche de préférence à celle des Seleucides. usitée dans tout le groupe de montagnes dont dépendait leur territoire; cela peut tenir au caprice du personnage qui a fait élever le monument, ou bien à la circonstance que ce village se trouve à l'extrémité des montagnes d'Ei-Barra. sur la limite, en quelque sorte, du domaine des deux ères. Quant à l'époque du commencement de l'année, pour laquelle il eût été fort incommode de s'écarter des errements suivis dans le voisinage, l'habitant de Ktell-Lata s'en est tenu à l'usage universellement adopté par ses voisins d'El-Barra, qui se servaient de l'ère des Séleucides et commençaient leur année au 1er octobre". While fossicking through some of the journal entries form before 1923 that have now been liberated in JSTOR I stumbled upon two articles related to Antioch and India. In the past I have written of a Chinese delegation arriving at the city and recording for posterity the sights they saw. In the first, "Some Aspects of the Overland Oriental Trade at the Christian Era" by WILFRED H. SCHOFF, Secretary of the Commercial Museum, Philadelphia, Pa.", the author speaks of the trade routes in the ancient Middle East. In relation to Antioch he notes " the route which led from Antioch in Syria to the ford of the Euphrates, thence down that river and across to Seleucia on the Tigris, up the Zagros valley, over the plateau to the Caspian Gates and north of the Persian desert to Nisaea and Antiochia Margiana; thence through Bactria to the Pamirs, or through Arachosia to Kabul and the Panjab". The other text is: On the Indian Embassy to Augustus by Osmond De Beauvoir Priaulx in The Journal of the Royal Asiatic Society of Great Britain and Ireland, Vol. 17, (1860), pp. 309-321. He writes that Nicolaus Damascenus, in a fragment preserved by Strabo, relates "that at Antioch Epidaphne, he fell in with three Indian ambassadors, then on their way to tho court of Augustus. They were, as their letter showed, the survivors of a larger embassy, but to the others the length of the journey principally had proved fatal. Their letter was written on parchment and in the name of Porus, and in Greek. It set forth that Porus, though Lord over 600 kings, much valued the friendship of, and was ready to open his dominions to Caesar, and to assist him on all just and lawful occasions. The presents they brought with them were in the charge of eight well-anointed slaves, naked all but their girdles, and consisted of a youth whose arms had been amputated at the shoulders in childhood, a sort of Hermes, some large vipers, a snake ten cubits long, a river tortoise of four cubits, and a partridge somewhat larger than a vulture". Well they say to beware of Greeks bearing gifts, but frankly we would be more wary of what these Indians were bringing! 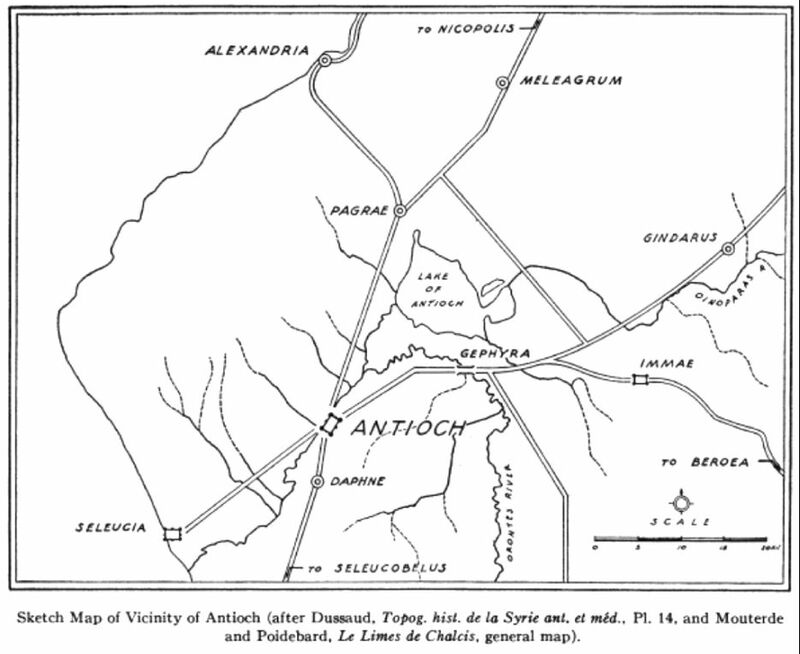 This little map pretty much explains itself: the routes and towns in proximity to Ancient Antioch. On the 2nd of January, 2012, in an article by Sindya N. Bhanoo the New York Times reported on the unravelling of a cruse scroll found in the 1930s by the Excavation Committee. It clearly represents a good example of the treasures that lie awaiting calssification and proper examination in the basements of Princeton University. "A vegetable seller named Babylas was the target of an alarming curse nearly 2,000 years ago. Written on a lead tablet found in Antioch, one of the largest cities in the Roman Empire, the curse calls on the gods to tie up the hapless greengrocer, then “drown and chill” his soul. The curse is described in the German journal Zeitschrift für Papyrologie und Epigraphik by Alexander Hollmann, a classicist at the University of Washington who studies Greek and Roman magic. The curse was written on both sides of the tablet. 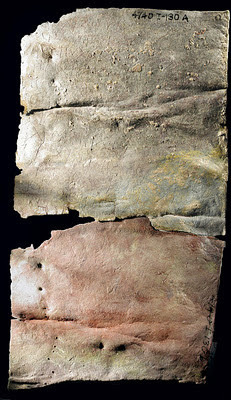 One side calls upon the god Iao to bind Babylas; the other side addresses multiple gods and calls for the tablet to be thrown down and “killed” in a well — followed, in the same way, by Babylas. Although the author of the curse is not mentioned in the writing, Dr. Hollmann speculates that it may have been a rival businessman. The tablet was found in a well in the 1930s, presumably the same one it was dropped in. Since then, along with many other items excavated from Antioch, which lies near Turkey’s Syrian border, the tablet has been at the Princeton University Art Museum. 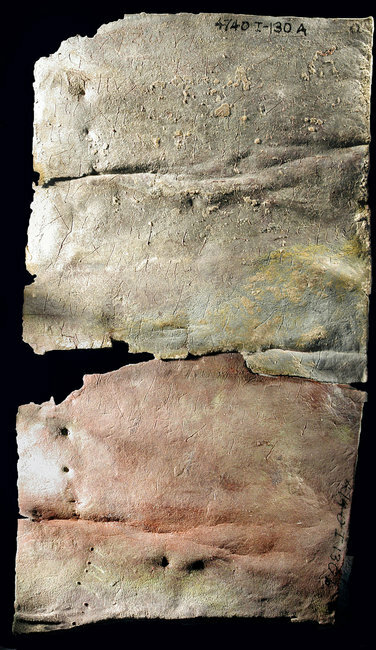 Curse tablets like this one have shown up in Rome, in Carthage in Africa and throughout the ancient Mediterranean region, said Dr. Hollmann, who has deciphered one other such tablet from Antioch and is working on six others. “They are so similar, because professionals were using magic books that circulated,” he said. “These had templates that were used for hundreds of years.”"